I had one of those horror movie plot kind of moments. Everything was so innocent and simple and then we met a python. Before I get into the story, let me just say owning a Python as a pet is ridiculous. 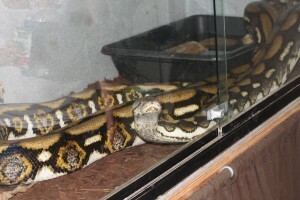 Owning a python as a pet when you have a child, should be considered child endangerment. Seriously? It should be illegal. 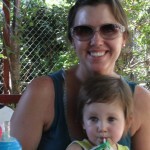 Look what happened in Florida…I’m nervous to visit my in laws in Boca Raton already because of alligators. 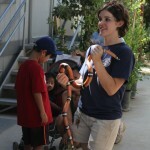 On Sunday, my friend Stephanie and I took Maggie to the Wildlife Leaning Center in Sylmar, CA. I was very excited to see this place, I’ve been waiting to take Maggie until I thought she would be old enough to enjoy the animals. I was ready to learn about the local wildlife and show Maggie as well. Let me just say I learned two very important things at the Wildlife Learning Center. First, Maggie is still too young to care, she enjoyed the rocks and the dirt immensely. Secondly, don’t go to the Center on a hot day. Whew! Maggie was miserable and just wanted to leave. We know this because she kept walking over to the exit door and waiting for someone to open it, so we could leave. 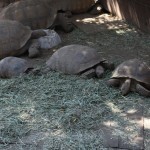 In my last ditch effort to show her some cool new things, we went into the Reptile Center. Big mistake. As we stepped into the room, I put Maggie down to run around. As I put her down, the Python had been calmly sleeping in its aquarium, suddenly starts moving around. Following Maggie’s every movement. At one point, the Python was slithering its head toward the roof of its aquarium looking for a way out (I didn’t get a picture of that, but I did get a Python watching Maggie pic). The final straw came when it looked straight at Maggie opened its mouth (like it was panting and ready to eat). Stephanie and I were both watching this scenario, as well as the Wildlife volunteer. 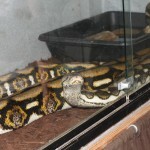 I wasn’t worried until the volunteer decides that it was time to unlock the Python’s glass doors and give it a spritzing of water. Really? I picked up Maggie and we left. Steph and I were both creeped out and Maggie was ready to go anyway. Even though the Python scared me, the weather was ridiculously hot and Maggie was uninterested, Steph and I had a great time. I will definitely be taking Maggie back when she is older and less edible and probably when it isn’t 110 degrees. This is a great place, you get to see the animals up close and personal and the staff does an informative demonstration every hour. Pretty cool. The worst part is I didn’t get to sleep but two hours that night because I kept having Python nightmares. At one point, while crying during the middle of the night about Pythons eating Maggie when we visit AJ’s parents in Florida. I woke him up. He looks at me, says I love you and ignores me. I get it, I would have ignored him too, but the discussion isn’t over. What AJ doesn’t know is, we will be discussing all python and alligator preventative measures before our next trip to Florida.